About Tea is Information About Kinds of Tea, Brewing Tea and Benefits of Tea. Learning about tea involves reading and tasting, the latter being the best part, but reading is what gives us some understanding and guidance. In the USA only 20% of the tea consumed is hot tea. 80% is consumed as ice tea, which was "invented" (marketed) in the US in 1904. Tea is an ancient beverage made by steeping tea leaves in hot water for a few minutes. Tea was apparently discovered by accident, but gradually became popular world-wide, spreading from China to Europe and the Americas. All teas come from the same plant (the tea bush is known as "camellia sinensis"). 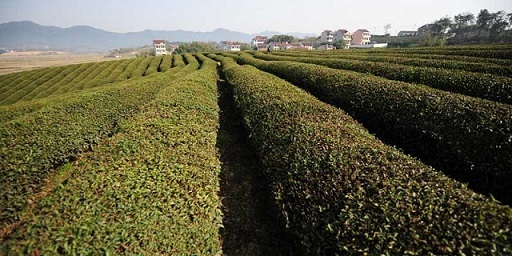 There are two types of the tea plant, the China type and the Assam type. The China type is grown in China, Taiwan, Japan, and parts of Darjeeling, and produces smaller leaves with a lighter flavor. 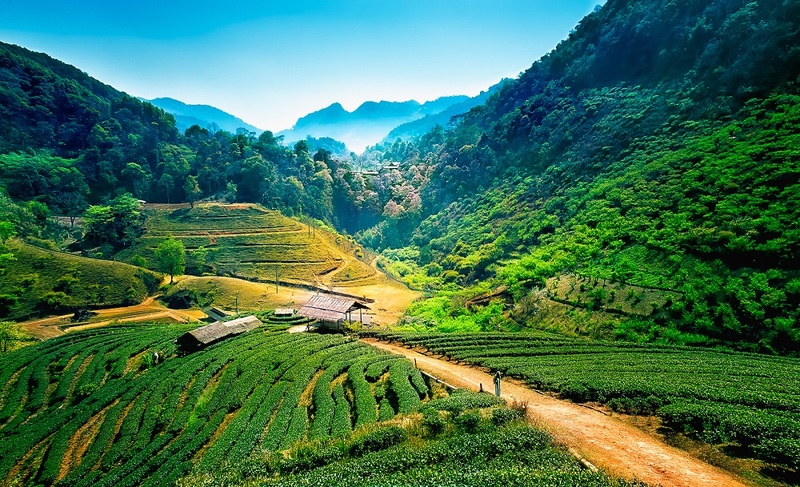 The other type (Assam) is grown in India, Sri Lanka, and throughout the rest of the tea-producing world, producing larger leaves with more strength. Then, within each of these types, there are dozens of local "variations" as a result of seed propagation and leaf cuttings. How the tea leaves are processed (how much oxidation of the leaves is allowed) determines whether they will become "black tea," "oolong tea" or "green tea." Black tea undergoes a full oxidation process (sometimes called "fermentation"). Oolong tea is generally referred to as a "semi-oxidized" tea. Oolongs are always whole leaf teas, never broken by rolling. Green tea is derived from leaves that are heat-treated to stop oxidation. In other words, little oxygen results in green tea. 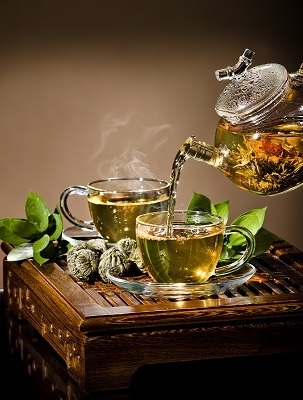 White tea is made of young leaves (new growth buds) that have undergone no oxidation. The new tea buds are picked (plucked) before they open and simply allowed to dry. White tea results in a very light, delicate tea. It is produced on a very limited scale in China and India. 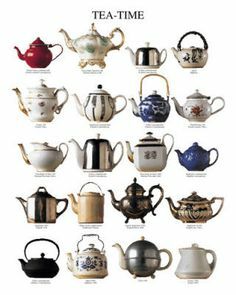 All other tea is derived from one of these basic teas. Much of the tea in tea-bags, and many other teas sold in western countries, are blends. Teas are often blended in an effort to produce a consistent taste from one year to the next. Tea leaves easily absorb aromas and flavors from other sources. This can be a problem in processing, transportation and storage, but can also be used to prepare scented or flavored teas. Scented teas are made when additional flavorings are mixed with the leaves just before the tea is packed. For example, whole jasmine blossoms are added to green or oolong tea making it "Jasmine tea." 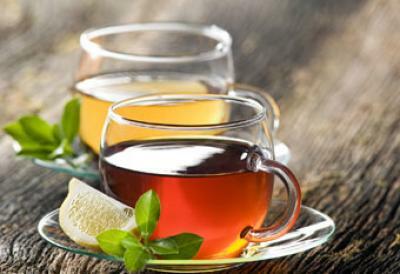 Fruit-flavored teas are usually made by combining a fruits' oils with black tea. The National Drink of India and Sri Lanka is probably Chai tea. The word ‘chai’ means tea. 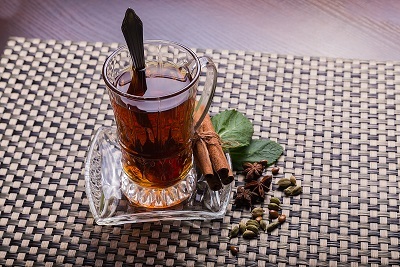 Chai is a black tea that is blended with cardamom, cloves, coriander, cumin seed, sweet cumin seeds, curry leaves, lemon grass, and rampe leaves (also known as pandan leaf). Most people I know enjoy Chai with a little milk and sugar. Herbal teas are not actually teas at all. The term herbal tea refers to infusions of fruit or herbs containing no actual tea, for example, rosehip tea or chamomile tea. Kukicha or winter tea, is made from twigs and old leaves pruned from the tea plant during its dormant season and then dry-roasted over a fire. It is popular as a health food with some people. Throughout history, tea has been believed by many to be medicinal. Tea is a natural source of caffeine and is also a diuretic. Recent research is leading many modern-day scientists to agree that tea, both black and green, may contribute positively to health and the prevention of chronic disease. Some studies indicate the antioxidants in tea may inhibit the growth of cancer cells and support the health of your heart. Grading tea is often thought to mean grading for quality, but quality is determined by the taste of the tea, not its appearance. However, the leaf shape and size of the finished tea has much to do with the characteristic taste of your tea. So the purpose of, and the approach to, grading tea leaves is to have uniform leaf density and appearance; to separate larger from smaller particles of leaf since they will extract at different rates when brewed. Tea leaves rolled in a given way have a particular flavor that differs from the same leaves rolled in a different fashion. Also, the more broken the leaf is, the faster brewing the cup, and typically the more body and pungency the tea will have. For example, did you know that "orange pekoe" is frequently taken to mean a type of tea? Actually, it is a term that refers to specific leaf size. The goal of "grading tea" is consistency. Quality comes from "consistency," and leaf size is a major element of obtaining that quality. Generally speaking, whole leaf tea is at the top of the pyramid, followed by various sizes of broken leaf teas down to "fannings and dust." Brewing the "perfect" cup of tea is only as difficult as you want it to be. With my restaurant (customer) experience and my research I can suggest a few guidelines ...but really, as with coffee and wine, you need to have some fun experimenting and finding out what "works for you." 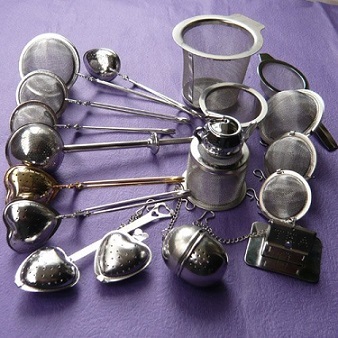 The three most important considerations are "Time, Water/Tea Amounts and Water Temperature." Experts suggest that you use one teaspoon of tea leaves per cup of water. (I think light teas taste best with twice that). With black teas or dark oolong teas (and "herbals), water should be about 212 degrees F (just boiling). 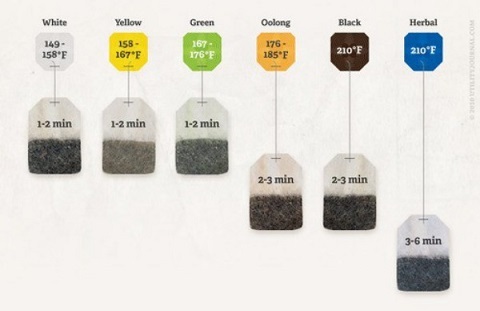 Steep your black teas for 2 1/2 - 4 minutes depending on the strength you prefer. Steep dark oolong teas for about 5 minutes (or slightly longer). For lighter oolongs, green teas and white teas, use water at about 180 degrees F. Steep the light oolong and green teas for about 3 1/2 minutes. Steep the white teas for about 5-6 minutes. If you like your tea stronger in flavor add a minute, or for more subtle flavor, subtract a minute. Does water quality affect the taste of the tea you brew? Yes, the better the water you use, the better the taste will be. Does the "right" equipment make a difference? Just what IS the right equipment? Japanese tea needs "room" when brewed. A tea ball is not recommended. Use a Japanese tea pot or tea strainer. 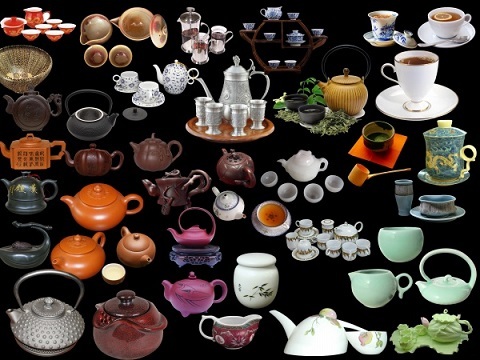 Other than that, you have a lot of leeway (see resources for tea presses, tea kettles, tea pots, tea cups, tea sets and other brewing and serving options below). I do like some electric tea pots because they bring water to the desired temperature and automatically turn off. Please remember that tea easily absorbs orders and flavors from other foods. You need to store tea in a tightly sealed container away from light, heat and moisture. Do not refrigerate it (moisture will build up and ruin it). If you do not have a "dedicated" tea canister, keep it in a tightly sealed plastic bag inside its original bag, also tightly sealed. Thanks for your interest in the article about tea. I hope you found it useful.